Postcards from the Attic: Inspired by IKEA! It was a beautiful weekend here and on Sunday I sat in the garden watching the bees feast on our rhododendron flowers. I think the sun made me get out the bright colours out and I spent a happy day in the craft room yesterday and made this, featuring my fave all time stamp, Stampotique's Big Bee. I sprayed the packaging with yellow and gold spray inks before tearing it off the backing and into pieces. Love the organic look! 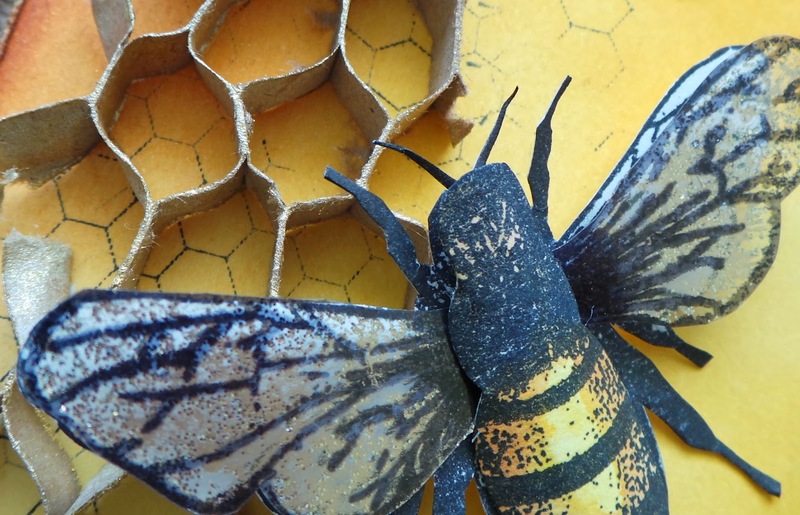 My bees have acetate wings covered with Stickles and White Fire Treasure Gold on the reverse so they really shimmer. I also added a domed body to give them some extra dimension. My original concept for this piece didn't include the sunflower - the SSS Challenge inspired me to add that detail and I think it finishes the piece really nicely. 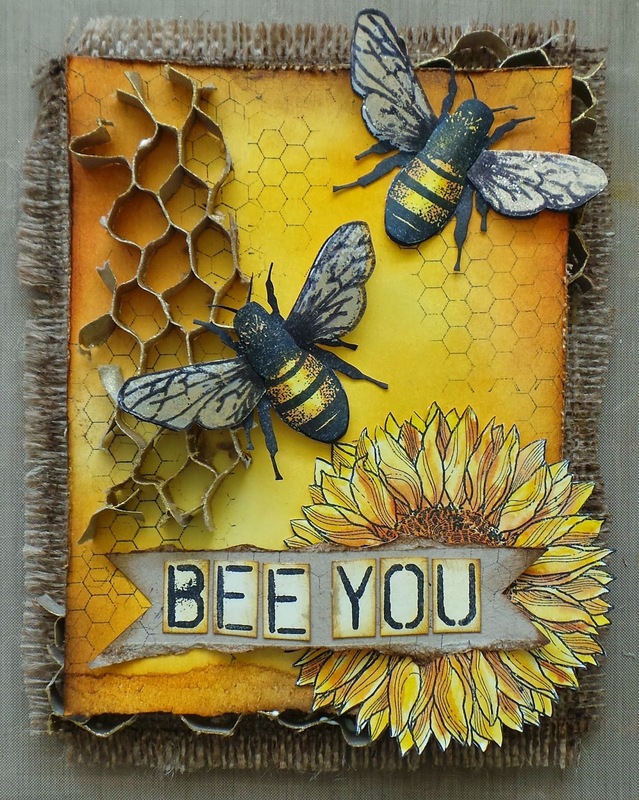 Stamps/products used: IndigoBlu stamp (sunflower), Stampotique Big Bee stamp, Wendy Vecchi Studio490 stamps (hexagon and sentiment), Distress Inks - Scattered Straw, Wild Honey, Mustard Seed, Rusty Hinge, Gathered Twigs, Stickles- Platinum, Treasure Gold - White Fire. 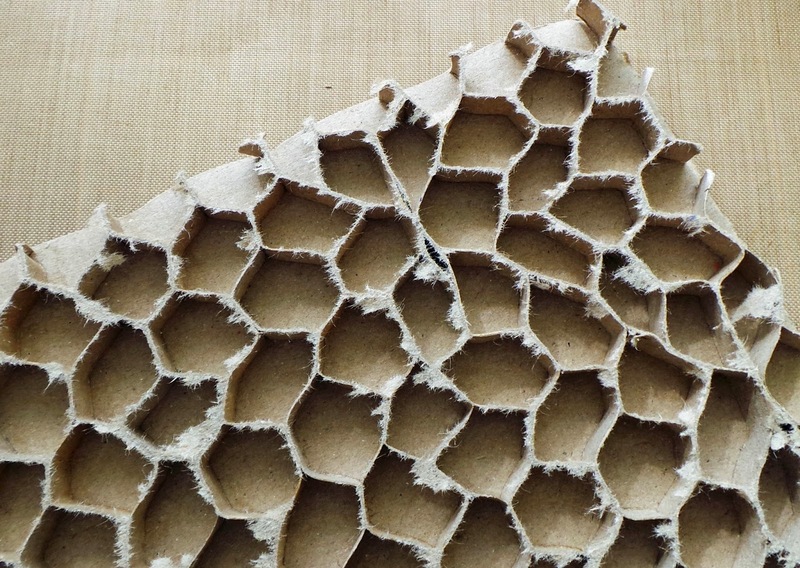 Brilliant piece and I love how it evolved from just a piece of packaging to now a piece of art! Many thanks for joining us over on the That's Crafty! Challenge blog. So creative - and beautiful too! Thanks for entering into the That's Crafty! challenge - and good luck in the draw. This is just bee-u-ti-ful and a clever sentiment. Burlap, sunflowers, bees, yellow and gold - it makes me what to live the country life. You definitely deserve the Spotlight from Simon Says for this one! In addition to all the praised elements mentioned above, I am drawn to the fussy cut bees and the sculpted bodies! Even cut the little legs and there is no white showing... my kinda girl!! Well done Katy! Congratulations! This is just beautiful!